MADRID -- Two doctors who treated a Spanish nursing assistant diagnosed with Ebola have been admitted to a Madrid hospital for precautionary observation, bringing to six the number being monitored at the center, health officials said Thursday. 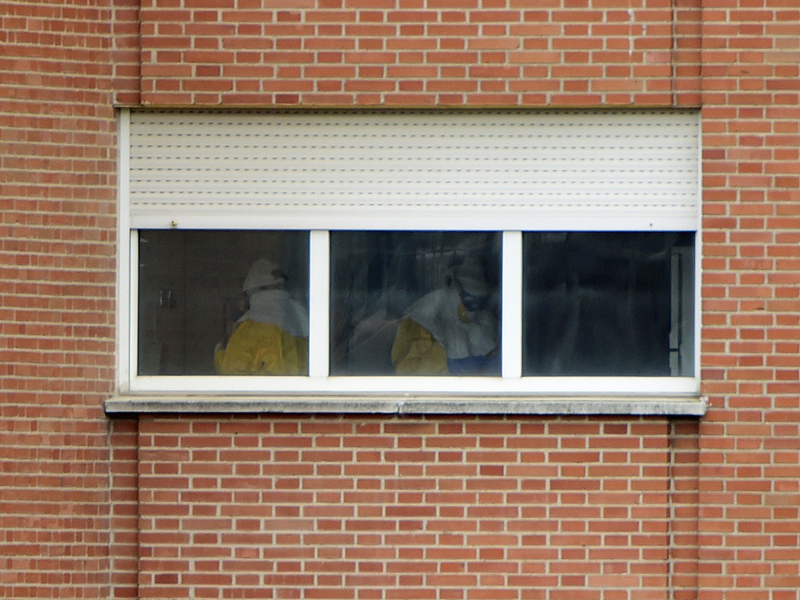 A spokeswoman for the Carlos III hospital said neither of the doctors, nor the woman's husband -- who is also under observation -- has shown Ebola symptoms. The doctors tended the nurse, Teresa Romero, before she was diagnosed as having Ebola on Monday. Two other nurses in quarantine are awaiting tests for the virus. One of the doctors, identified by Spanish newspaper "El Mundo" as Juan Manuel Parra Ramirez, admitted himself for monitoring voluntarily after writing an internal letter suggesting he had concerns over a protective suit he was provided to examine Romero. According to El Mundo, which obtained a copy of his letter, Ramirez said the "sleeves of the protective suit were too short," leading him to believe he could possibly have been infected during the examination. Romero is the first person known to have caught the disease outside the outbreak zone in West Africa. El Mundo, one of the most widely read papers in Spain, reported Thursday that her condition was deteriorating. The paper cited Romero's brother, who told reporters at the hospital doors on Thursday that his sister began experiencing pulmonary problems overnight, and that her team of 14 doctors was going to try a new medication to bring her symptoms under control. Ebola has killed at least 3,800 people in West Africa with no signs of abating. The presidents of Liberia, Guinea and Sierra Leone, the countries hardest hit in the outbreak, are appealing to the World Bank on Thursday for more help for their nations.